Could you please explain what the new ‘indent’ functionality exactly is? The only reason I gave up on using BASin in the past was its lack of the ability to indent the code, which is ‘kind of’ present in the original Sinclair Basic, as you could simply put spaces after the line number and these were printed/remembered. Is that it? 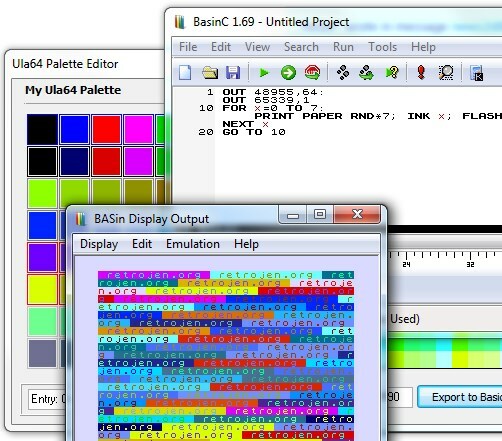 I cannot tell any difference and F2 seems not doing anything at all (other than changing the option); Basinc seems to just ignore all the spaces at the beginning like BASin did in the past. I’ve also tried to look this up in the sources, but these seem kind of old: the name of the included archive is ‘Basinc16r3-Source.zip’ and the newest file from there is from 2012. See screenshot above, at line 10, there is a loop and PRINT statement is automatically indented. This functionality may contain bugs, as it’s a proof of concept rather than a full design. As a basin policy, sources only released at first release of a Major version. Minor Revisions is not inlcuded in the source package. This is brilliant! Thanks for the hard work Arda! Great tool. Any plans to update to support the Spectrum Next? Also variable called “E” is not colourised correctly by the editor. For example, if you set red for the colour of variables and enter “100 LET e=100” the “e” will not turn red.